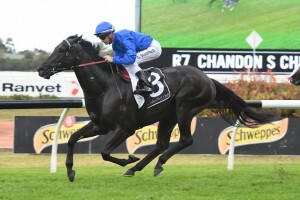 In-form Godolphin-raced galloper Kementari is the headline three-year-old among the official Randwick Guineas 2018 nominations taken for the mile classic running in Sydney on Saturday. Hobartville Stakes winner Kementari heads the 2018 Randwick Guineas nominations for Saturday in Sydney. Photo: Steve Hart. This year’s edition of the Group 1 $1 million Randwick Guineas (1600m) is shaping-up as a class showdown and one of the top youngsters in the mix is the James Cummings-trained Lonhro colt Kementari who has won both his lead-up runs. Runner-up in the Group 1 Caulfield Guineas (1600m) over this distance in Melbourne during the spring, Kementari won first-up in the Group 3 Eskimo Prince Stakes (1200m) and saluted again at Rosehill on February 24 in the Group 2 Hobartville Stakes (1400m). Returning to Royal Randwick for the first time since a four length win over 1400m at the track last winter, Kementari is sure to sit near the top of Randwick Guineas betting at Ladbrokes.com.au. The Hobartville Stakes has produced seven of the past eight Randwick Guineas winners with Kementari out to do the double for the first time since Hallowed Crown (2015). The other best out of the Hobartville Stakes this Sydney Autumn Racing Carnival nominated for a rematch in this weekend’s Group 1 are runner-up Pierata and third placegetter D’Argento. A nicely-bred colt by former Golden Slipper winner Pierro, Pierata is prepared by Gregory Hickman and has won four of his nine career starts to date including most recently the $2 million Magic Million 3YO Guineas (1400m) at the Gold Coast in mid-January. He was a length beaten in the Hobartville Stakes next up over a month after and will be fitter for the run. D’Argento is one of five Randwick Guineas 2018 nominees for Sydney’s leading trainer Chris Waller who chases his first win in the classic. The striking grey So You Think colt won his opening three career starts in easy company before the brave third in the Hobartville Stakes trifecta in his Group race debut. Waller’s other standout Randwick Guineas entry is Snitzel colt Tangled who ran second in the Group 1 Spring Champion Stakes (2000m) at Randwick last October. His latest run was in a 1500m Rosehill race late last month when sixth but only two lengths off the winner first-up. The Kiwis could be represented in this year’s Randwick Guineas field by the Stephen Autridge & Jamie Richards-trained Fastnet Rock colt Age Of Fire, a Group 1 winner over the mile across the Tasman this summer and second in last year’s NZ 2000 Guineas (1600m). Two top performers in last weekend’s Group 1 Australian Guineas (1600m) at Flemington in Melbourne are nominated for a quick interstate back-up with runner-up Peaceful State for Darren Weir and Aaron Purcell’s fourth placed All Too Hard colt Villermont. The filly Mosheen (2012) was the last Randwick Guineas winner to come off the Australian Guineas when she did the double for trainer Robert Smerdon. Check out the full Randwick Guineas 2018 nominations below, updated odds to open shortly at Ladbrokes.com.au.